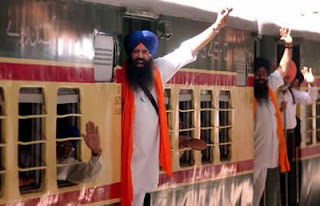 LAHORE: About 3,100 Sikh pilgrims arrived at Wagah by trains on Friday to participate in Baisakhi festival, the birth of Khalsa. The main religious function at Gurdwara Panja Sahib will be ‘Arambah Paath Sahib’ today (Saturday) at 8am. ‘Madah Ka Bhog’ on April 13 at 8am and ‘Bhog Akhand Paath Sahib’ on April 14 at 8am. From April 15 to April 17 pilgrims will stay at Gurdwara Janam Asthan Nankana Sahib and on April 16 will visit Gurdwara Sacha Sauda. From April 17 to April 20, pilgrims will stay at Gurdwara Dera Sahib at Lahore and on April 18 will visit Gurdwara Rorri Sahib Eminabad (Gujranwala). On April 20 pilgrims will leave Pakistan in the morning for India.